This aircraft is pictured just moments before it burst into flames and went out of control, all ten crew members were killed in action. These are the last moments of a Consolidated B-24 Liberator bomber of USAAF (United States Army Air Force). It was part of a squadron engaged in a raid on an industrial target in Austria. German fighters came up in force, downing all the bombers except the one from which this photograph was made. The aircraft, named “Extra Joker”, was attacked by at least two German fighters Focke-Wulf Fw 190 while flying over the Austrian city of Turnitz. Within a few seconds flames enveloped the plane and it exploded. All 10 crew members were killed. The photograph was taken by Sergeant Leo Stautsenberger who was the cameraman of the Extra Joker. Luckily for him, on that fateful day they asked him to fly on another plane to take photos of the Joker in flight. Thanks to this coincidence Leo lived and made a series of shots of the loss of the aircraft. He said about this picture: “I felt guilty, helplessly snapping a picture while the men were burning inside. It happened so fast they didn’t had much of a chance. I had photographed a picture of death, with the crew burning inside”. 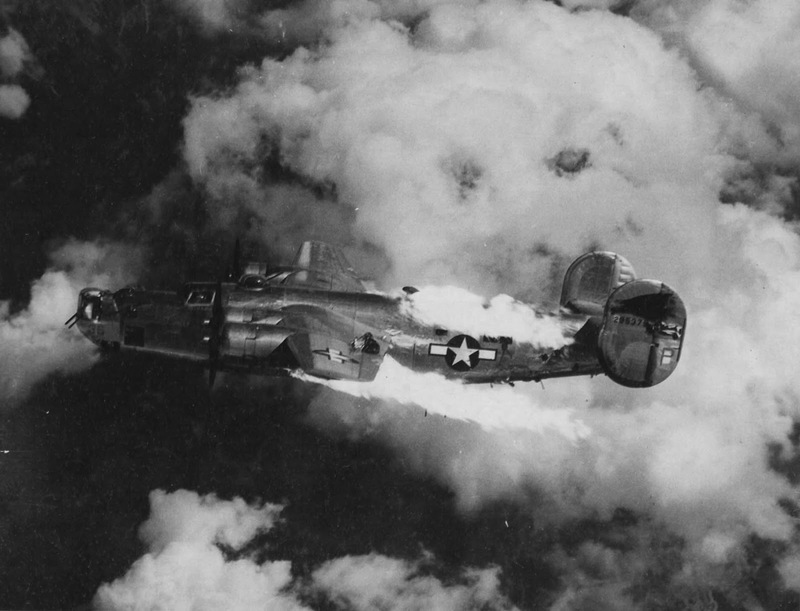 Flak was a serious problem for the B-24 Liberator. The accuracy and concentration of flak over Europe was never contemplated during the design of the B-24. Germany was very good at delivering flak, which became very accurate after the development radar guidance systems. Also, German fighters would fly up to the level of the bombers and report the altitude of the bomber formations. Allied bomber squadrons used evasive maneuvers to avoid flak, but the bomber streams remained very vulnerable to the devastating effects of flak. The B-24 also had a higher accident rate, which was giving it the reputation of a widow maker. In 1943 alone, 850 Second Air Force crewmen were killed in 298 B-24 accidents.